CPW warns moose are very protective of their territory and young. ​According to wildlife officials, a major catalyst in serious moose conflicts is the presence of dogs. 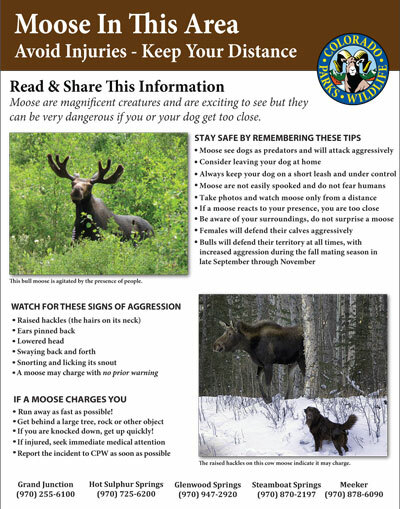 When people, dogs and a defensive moose interact there is a significant risk of serious injuries to humans and pets. In addition, because CPW officers will act to protect the public in any wildlife conflict, it could lead to the death of a moose. Moose react to all dogs as they would to a wolf - one of their primary predators - by attempting to crush it with their hooves. Because of this instinctive, aggressive response, CPW officials recommend keeping dogs on a leash and under control when recreating in the backcountry, or consider leaving the dog at home. Since 2013, CPW is aware of at least 15 moose conflicts resulting in minor to serious human injuries.​ In all but two occurrences, dogs elicited the initial response from the moose. 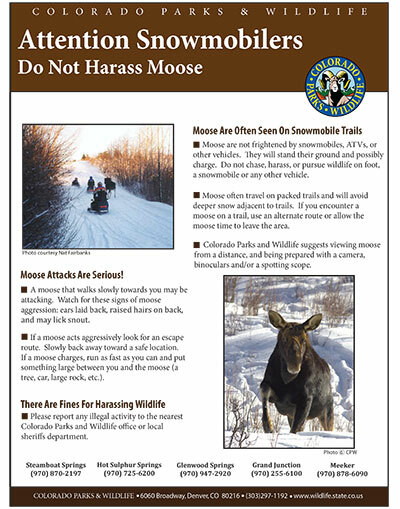 Read the full story, CPW Warns Public and the "Moose and Dogs: Tips to Avoid Injuries and Keep Your Distance"​ flyer. Moose have very few natural enemies in the wild and, as a result, do not fear humans as much as most other big game species. Moose tolerate humans longer and at closer distances. They are extremely curious and often will approach humans or houses, and even will look into windows. For these reasons, it is extremely important to understand moose behavior when living in or visiting the areas they inhabit. Female moose (cows) are very protective of their young (calves), so they can be dangerous if approached or caught off guard. Bulls can also be aggressive and territorial, especially during the breeding season (rut) in the fall. Some bulls have taken over pastures and injured or killed livestock while defending their territories. Moose have also taken over feed yards and haystacks and will defend them from any and all intruders, whether they’re livestock or human. Keep pets away, as moose can get quite aggressive around them. Be especially cautious when walking dogs. While moose encounters with people are quite common, moose cause few problems. However, moose have "treed" people who have approached them too closely, have killed or injured pets or livestock, and have chased people away from territories they are defending. Caution and common sense go a long way in preventing potential problems with moose. Colorado Parks and Wildlife is liable for damage to crops, forage and fences caused by moose. If moose are causing damage, contact your local CPW officer immediately. An increasing concern for our Colorado moose and for people is moose on the road. To learn tips on how to drive safely in moose country, read Moose Present Challenge to Motorists. ​Look for moose sign—large tracks, droppings, browsed willows—along the edges of willow bottoms and aspen or pine forests. It will be evident if moose are present! Find a high spot that looks down into drainages for an​ excellent vantage point. Moose sounds are limited to grunting, with bulls being the most vocal during the mating season. Moose do not herd into large groups as do many species of big game, even in winter. They prefer to travel in small family groups or to remain secluded. Move slowly and not directly at them. Back off if they exhibit signs of aggression, such as the hair on their neck standing up, licking their snout, cocking their head, and rolling their eyes and ears back. Moose are excellent swimmers and very much at home in the water, which can be a good place to view them. ​​​​Moose often fall victim to accidental kills. The greatest threat to Colorado’s moose are people. In fact, 15 percent of the state's moose mortality each year comes from illegal kills. Because of their docile demeanor, moose have become common victims of poaching and accidental kills. Colorado Parks and Wildlife has taken extensive precautions to prevent the illegal and accidental killing of moose by deer and elk hunters. Accidental moose killings can be prevented if hunters take the time to accurately identify their targets. CPW research shows Colorado residents kill as many moose by accident as nonresidents, and experienced hunters shoot as many moose as the inexperienced. If hunting deer or elk, be sure what you shoot is a deer or elk! (See the Moose vs. Elk video below.) Hunters should look at several attributes (head, body and antler conformation, color) before pulling the trigger. Moose have a dark, black-brown body with an overhanging snout, a bell on the throat and whitish, gray legs. Elk have a red-brown body, chestnut brown neck, pale yellow rump and slender snout. Every hunter should be equipped with good optics, beyond rifle scopes. Hunters don't often expect to see moose in heavy timber or in open areas. When they do see something, they are tempted to shoot hastily, thinking it is an elk and might get away. Because moose often do not run away from hunters, or are relatively slow in doing so, they end up being shot through carelessness of hunters. If you shoot a moose accidentally, please do the ethical thing: report it to the nearest CPW office or officer. The animal should be field dressed immediately to prevent spoilage of the meat. CPW handles accidental kills that are reported immediately differently than when a hunter leaves the animal in the field and is apprehended by other means. The fine for illegally killing a moose is $1,370. If you observe someone, or know of someone, illegally shooting a moose, report it to wildlife authorities immediately. Provide as much information as possible about the circumstances, including the incident location and description or identity of the shooter. Moose are a valuable asset to the state of Colorado. Credit for this wildlife success story goes to all the hunters who helped pay for wildlife conservation through their hunting and fishing license fees, as well as the Safari Club International and John B. Farley Foundation, which provided the funding to bring moose to Colorado for all of us to observe and enjoy. 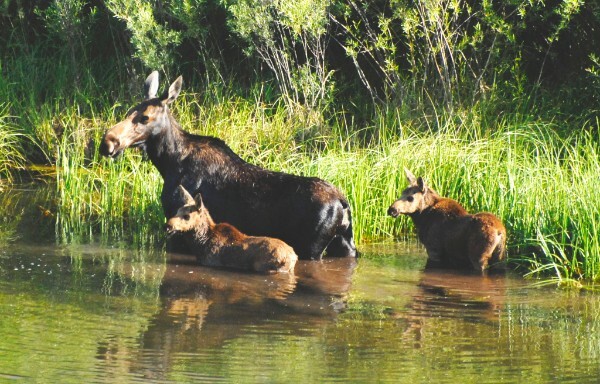 Emergency and non-emergency problems or questions related to moose should be directed to the nearest Colorado Parks and Wildlife office if during normal Monday-Friday business hours. Emergencies involving moose, if outside of normal business hours, should be directed to the nearest law enforcement office. They will be able to contact a wildlife officer if necessary. Feel free to contact CPW via e-mail​ if you have other questions or concerns.